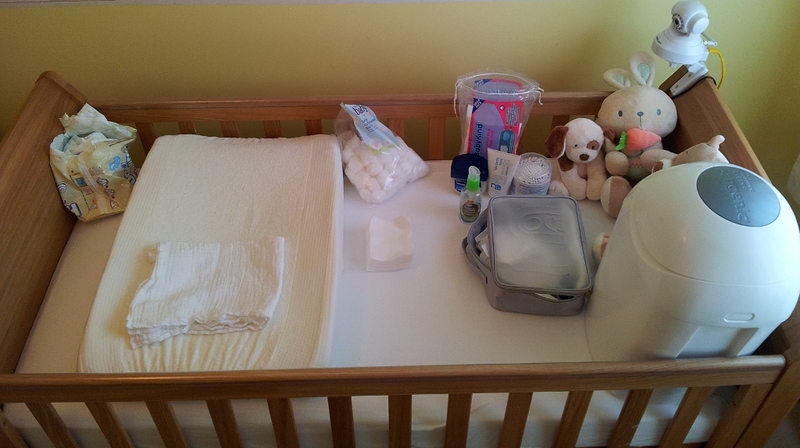 Anyway, left to right, we have the fresh nappies on the ‘clean’ side of the changing wedge (which has washable covers). There’s also a muslin on the wedge, just to catch the worst of it if he goes mid-change, which has happened once or twice. There’s a nappy pail on the floor with water and dettol in it – the muslin and cover go in there if soiled, until we get them into a wash.
Cotton cleaning pads (which are so much easier than the cotton balls to use when cleaning up the normal nappy-related mess, but we keep the balls around for things like cleaning the cord and naval and so on). Some left out in a small stack before the change, the rest in the bag. Cotton buds and liquid talc in case he had a particularly wet nappy, but we usually don’t use it. Incidentally, both the vaseline and liquid talc are on the wrong side – I wanted there to be a ‘clean’ and a ‘dirty’ side to the changing wedge, with one side (‘dirty’) used only for the cleaning up of the poop, and the other side (‘clean’) used after that for putting on stuff that would stay on till the next change. Hand sanitizer. Use once before beginning the change and once after having cleaned him up and before putting on the stuff that’ll be on him until the next change, like vaseline or liquid talc. The mothercare case that was our nappy bag on the ward. Right now it just holds the small plastic bags we use to bundle up all the debris from a change. Tommee Tippee nappy bin, which has an antibacterial nappy bag setup internally, which is really nifty and keeps bad smells locked away. Even with all the sun of late, there’s no odour in the nursery. We don’t quite fill this in a week, at least so far. Handy little thing. There’s a tallboy out of frame to the right, over the changer’s shoulder and within arm’s reach and there are more bags of nappies, pads and cotton balls on the top of it and more supplies in the top drawer, all within arms reach. There’s another cupboard in the room with yet more supplies, which we use to top up the supplies on the tallboy between changes. The toys occasionally help distract during the change, but mostly, it’s just somewhere to store them until he’s old enough to find them interesting. The white webcam is our baby monitor, mounted to the cot itself. Like I said, it’s pretty basic stuff and probably not news to anyone, but what the heck. Anyone see anything useful that’s missing?